This was a very early article in Newsletter 4, from the pre-website days, which was sent out as an email on 7th February 2013. Where was this 1881 ketchup factory in Yau Ma Tei? And can anyone provide more information about it? Speaking of Kwok Acheong here is a quote from a report by Governor Pope-Hennessy written in 1881. “I went with Mr Kwok Acheong and two or three other Chinese gentleman interested in the factory in Yau-ma-ti, which was in a more or less rude state…I was glad to see what they were doing. 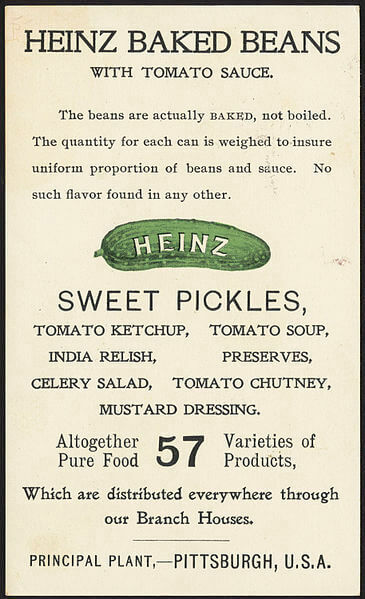 Heinz launched its tomato ketchup in 1876, so the HK version might have beaten the American to it. But when did the Yau Ma Tei factory open? Neither was first however, one Jonas Yerks, also an American, is believed to have been the first manufacturer of the esteemed condiment, having done so in 1837. 1837? 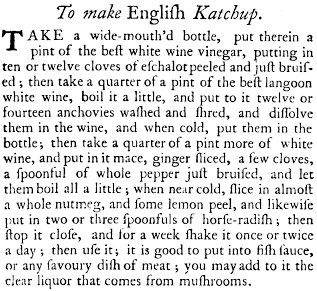 This recipe is from Eliza Smith’s The Compleat Housewife, or Accomplish’d Gentlewoman’s Companion, which in 1727 became a publishing sensation with many reprints throughout the century in the USA. It is also credited with being the first cookery book published in America (Williamsburg, 1742). Eliza maybe not have actually sold her time-consuming katchup but credit where due.